Volume 1 of a 3-CD series of the evolution of the 18th-century flute sonata from Bach to Bach's sons to Mozart. 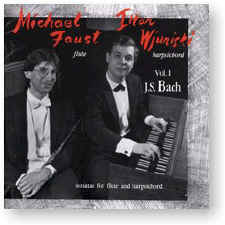 Not only J S Bach's famous sonata, but rarities by Johann Christoph Friedrich Bach and the eight-year-old Mozart as well (on Volume 2), performed by Michael Faust (principal flutist of the West German Radio Orchestra, Cologne) and Ilton Wjuniski (1985 Pro Musicis award winner, unanimous acclaim). The booklets contain both English and German texts with photographs and comprehensive, insightful and engaging program notes by author, historian and teacher Hans-Peter Schmitz (former principal flute of the Berlin Philharmonic and perhaps the world's most respected authority on Baroque flute literature and performance). Additional insights by producer Gunther Schuller and harpsichord maker William Dowd who designed, built and discusses the Paris 1730 style instrument (with knee levers added for dynamics) used for Volume 3. Recorded 9-12 May 1991 at Methuen Music Hall in Methuen, Massachusetts.